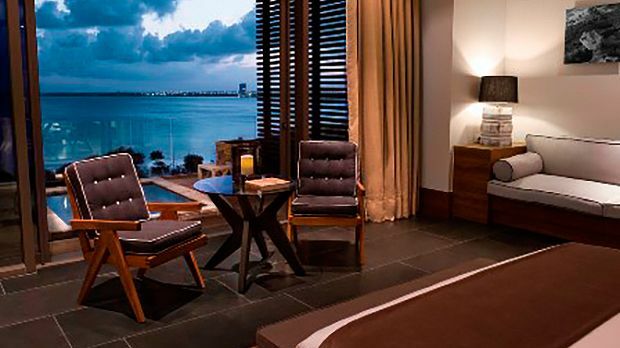 Perched next to a golf course on a private white sand beach, NIZUC is a short fifteen-minute drive to Cancun International Airport. Close your eyes and let your imagination take you away… to a time when Mayan civilization existed in the present day, when the landscape around you was unspoiled, and life was simple if tenuous. Fast forward to today, and when you open your eyes, you find yourself in a beautiful, safe place; with family and friends close by, protected mangroves and lush foliage surrounding you, and Mayan magic dancing in your dreams. 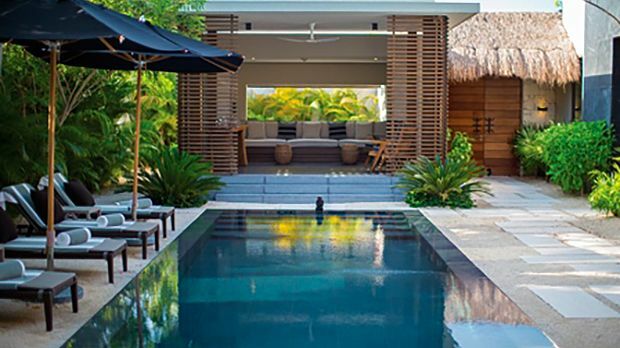 Whether you have traveled to NIZUC Resort & Spa with romance in mind, family fun on the agenda, or as a group of friends, there will be little to find fault with here. 274 suites and private villas are spread throughout a sprawling estate, an area that also contains six restaurants, a variety of awesome pools, tennis courts, a large spa, two private beaches, meeting spaces, and more. Send your little ones to the Kids Club, sit back, and allow NIZUC Resort & Spa to take care of the rest. 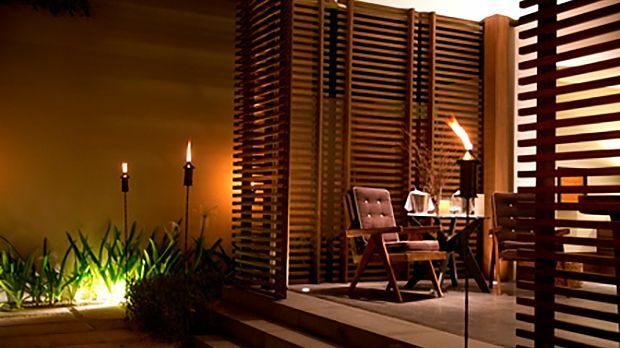 Send an availability request with your requested dates to the Nizuc Resort & Spa. 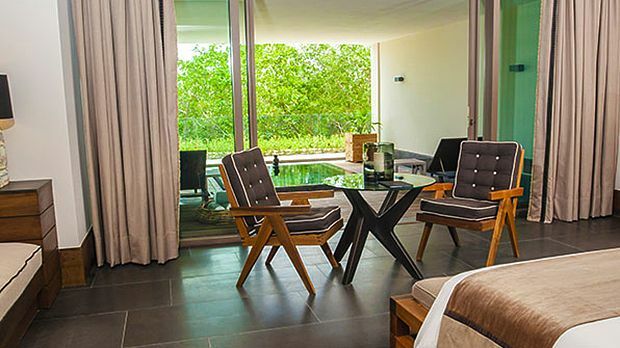 Features floor-to-ceiling windows, a terrace, blackout curtains, bathroom with rainfall shower. Features 1 King bed, blackout curtains, bathroom with bathtub and separate rainfall shower. Features Double beds, floor-to-ceiling windows, blackout curtains, bathroom with separate rainfall shower and deep soaking tub. Features a large interior space, floor-to-ceiling windows, private terrace, infinity plunge pool, King bed and blackout curtains. 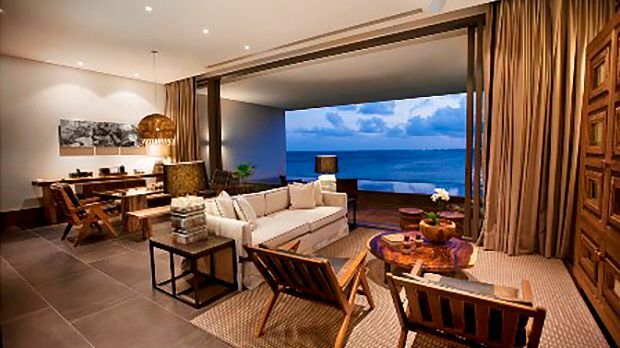 Enjoy views of the resort’s verdant tropical garden from this 1,475 sq ft suite. This deluxe suite features 1,030 sq ft of interior space and floor-to-ceiling windows that open onto two private terraces providing 445 sq ft of outdoor space that features a stunning infinity pool. 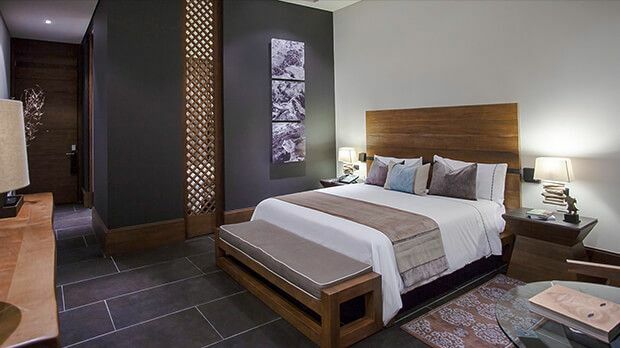 A king bed draped in fine Egyptian cotton linens and blackout curtains provide a night of comfort and tranquility. The large bathroom boasts a freestanding deep soaking tub with separate rainfall shower and luxurious amenities such as plush bathrobes, slippers, and L’Occitane products. In-suite entertainment is provided through a state-of-the-art system with flat panel televisions in both the bedroom and bathroom, as well as IP Avaya telephone, Radio with iPod dock, and WiFi. 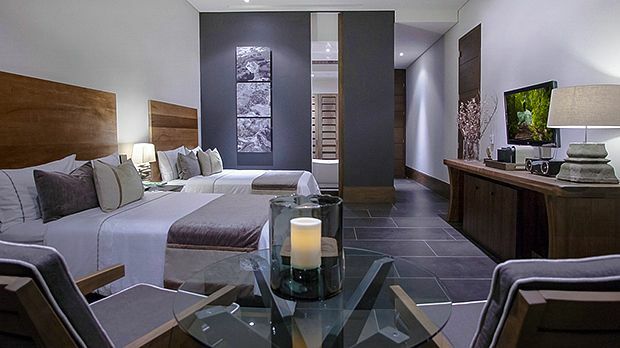 The suite is well equipped with a mini-bar and Nespresso coffee maker. 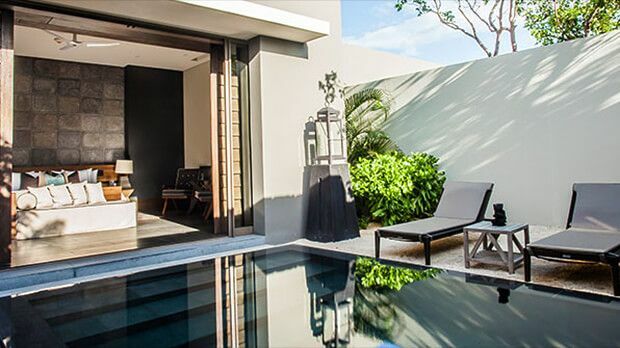 Features a private tropical garden, infinity pool, waterfall, King bed, blackout curtains and a large bathroom. Features spectacular views of the Caribbean Sea, floor-to-ceiling windows, terrace, King bed, blackout curtains, large bathroom with deep soaking tub and rainfall shower. 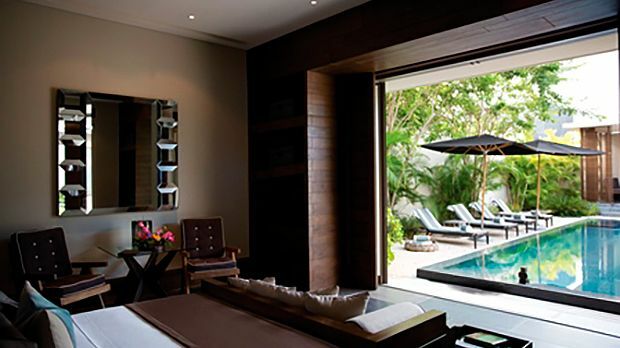 Features a King bed, private tropical garden, infinity pool, waterfall, blackout curtains and large bathroom. 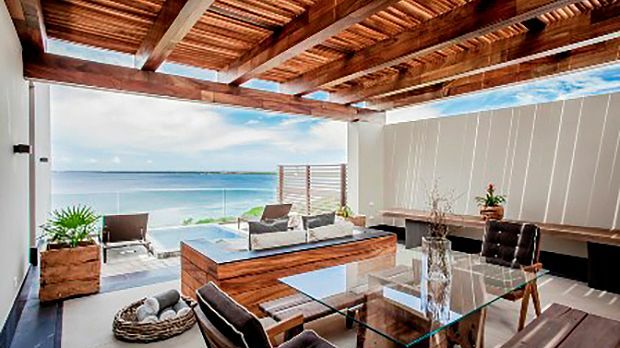 Features a King bed, floor-to-ceiling windows, ocean views, bathroom with rainfall shower. 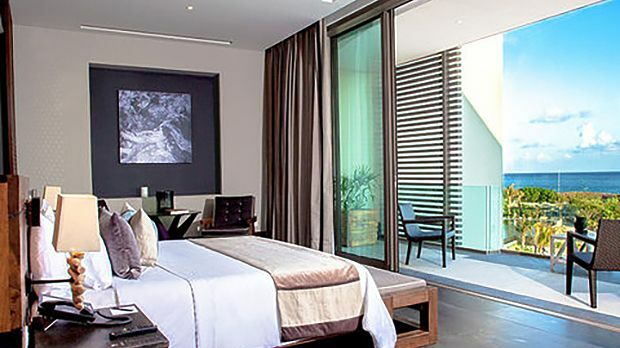 Features a large interior space, King bed, lush tropical garden, rooftop sundeck, infinity pool and blackout curtains.